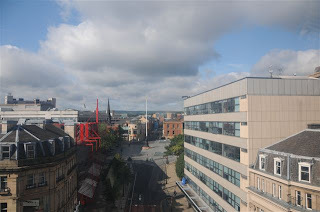 Boos Mummy: Sheffield from the air! 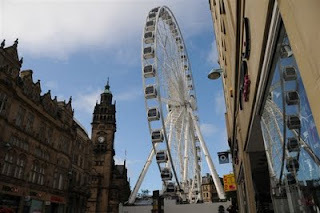 Sheffield has its own Big Wheel for a while. Its at the end of one of our main town centre shopping areas. Looks huge inbetween both the historic and the new buildings and towers over everything. 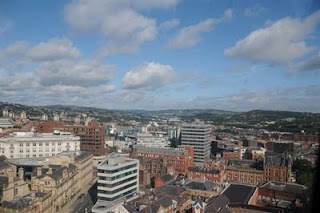 The scenes from the top are amazing, showing quite a bit of Sheffield but obviously not all of it. 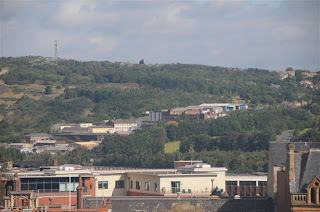 These are a few pictures that DH took through the tinted glass of Sheffields wheel. One view from the top showing one side of the city into the distance. Looking up into the newly refurbished Barkers Pool area. The red metal is where the old cinema used to be, it closed down years ago and now houses shops such as Mothercare and Early Learning Centre. I really cannot believe that I am writing to someone who doesn't like gardening!! You might be interested in my latest blog (it's not a gardening one this time) which shows the most incredible stitchwork. That's some views!! Didn't know about cinema though. Just shows how long it is since I was in the centre! Up that end anyway. 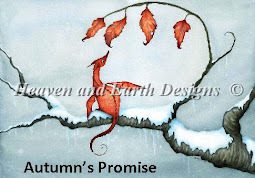 I remember the daffodils on the verges....lol. Especially round the Officer Quarters in Wimbish...till the kids went round that is. Lots of happy mummies then! Stuart (DOE) decided to plant crocuses then to stop them pinching them....yeah, right!!! Still lots of happy mommies with full egg cups, lol.